The Frank M. Coxe leaves Burlingame – Update! October 31, 2015 The Sherman Saga Continues: Update thanks to the Stockton Record online newspaper! 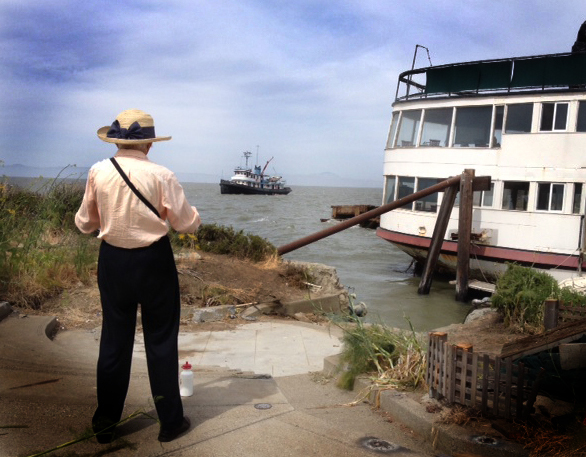 On June 15 2014, the Sherman was removed from Sanchez Channel after 43 years in Burlingame. 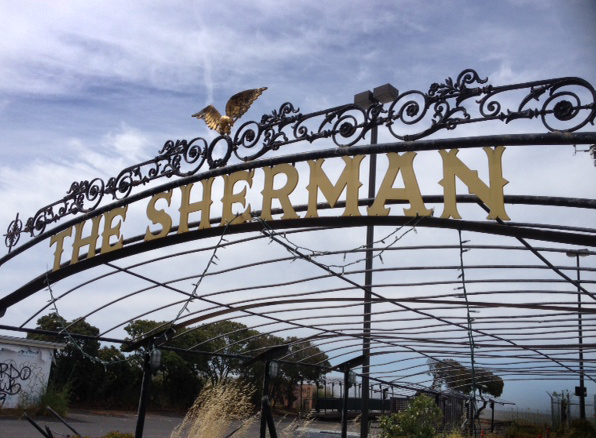 The Sherman Restaurant in the historic 91 year old S.S. General Frank M. Coxe closed its doors early in 2010 after approximately two years after opening. 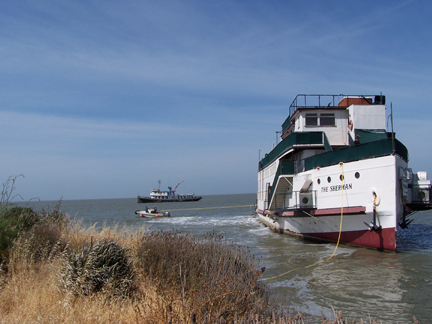 About four and a half years later a group of new investor owners arranged to have the S.S. Coxe towed in June, 2014, back to Stockton, where in 1955, it had been stripped of its engines and machinery and converted to the “Showboat Restaurant,” the first of her eleven floating restaurants. Built as a 150-foot river steamer in 1922 in West Virginia for the Army Quartermaster Corps, the S.S. Coxe was sent to San Francisco to serve as a harbor transport for Army personnel and their families between mainland San Francisco and the island forts around the bay. 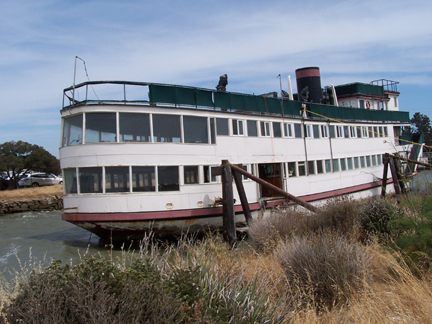 In 1958 the S.S. Coxe was towed to Oakland and soon continued as the “Showboat” in Jack London Square for about 12 years. 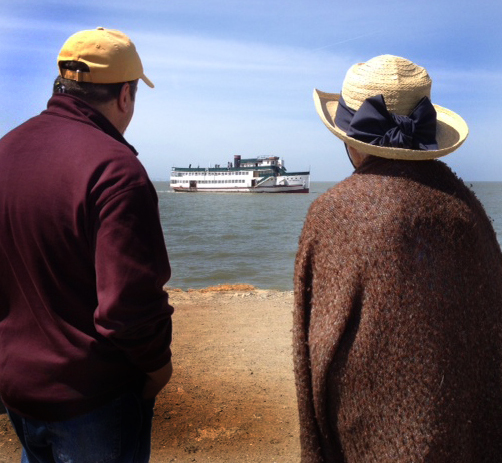 In 1971 the Ship was towed to Burlingame’s Sanchez Channel for its longest period in one location, 43 years. One by one, nine different restaurants were opened and closed during this time. Update! The artifacts related to the ship have been acquired by the National Park Service Golden Gate Nat’l Recreation Area Museum Collection, and will be housed in the Presidio Building Archive in S.F. where they will be available to the public for research and viewing! We are so pleased the Nat’l Parks Service will be taking good care of them into the future. 2 Responses to The Frank M. Coxe leaves Burlingame – Update! I believe I own a vintage set of salt and pepper skakers in the shape of a ship. Printed on the side is SS Frank M Coze, San Francisco. Is there a place where this can be displayed? I can send photos. Thank you. Yes. We would love to have them. You can send them to Burlingame Historical Society, PO Box 144, Burlingame, CA 94011. We will in return send you a deed of gift for your files. If you need to contact me, please use russ@russcohen.com. Thanks.